1. A thought about Randy Moss from St. Isaac the Syrian. 2. A rudimentary, deeply flawed, but maybe still somewhat meaningful attempt at separating running backs from their offensive lines (and vice versa). 3. About as much je ne sais quoi as is safe for an adult human to experience in one sitting. Soak in the joy, America! As usual, a glossary of all unfamiliar terms can be found here. The problem with this type of story is the amount of noise it creates. A brief glance at the sporting section of Boston.com (the Boston Globe's homepage) reveals no less than eleventy articles on the subject. These articles make precisely the points you'd expect them to, and a number of others that I, for one, would prefer they didn't. Tony Massarotti, for example, states that now the Patriots will "seek to reclaim the magic and karma that made them the preeminent franchise in football." Magic and karma -- along with grit, sticktoitiveness, and a can-do spirit -- are the abstract concepts to which sportwriters appeal when they're unable to identify the underlying causes of the phenomena they're attempting to describe. Which, it's fine not to know the answer, but the responsible thing -- veryveryvery obviously -- is to say "I don't know." [He] consciously avoided writing on topics that were disputed or discussed in the contemporary theological debates. This gives Isaac a certain ecumenical potential, and is probably the reason that although he was faithful to his own tradition he has come to be venerated and appreciated far outside his own "Nestorian" church. In fact, St. Isaac's behavior with regard to the heated theological questions of his day is examplary of the Eastern monastic tradition, generally. While the rationalistic theologians of the Middle Ages all lobbied wildly on behalf of their respective versions at conciliar debates, monastics were generally removed from these dialogues, preferring instead to pursue a distinctly more spiritual theology. Were St. Isaac -- who, again, quite obviously, was wild about football -- were he to consider this matter, he'd worry about only those things we could possibly know, and then he'd move on. • Minnesota finished first in offensive EPA last year, at +172.3, and second overall with a 0.16 EPA/P. • They finished second in Pass EPA with a +182.5 mark and also second in EPA/P, at 0.29. • They're also currently ranked 30th in Pass EPA/P -- ahead of only Arizona and Carolina (i.e. two teams that are basically without a quarterback) -- with a -0.15 mark. The question that's tougher to answer is this one: How will Moss's arrival impact Minnesota's offense? Insofar as Randy Moss is good and the Vikings, so far, are very bad, the answer is probably not "Ruin it." Otheriwse, "Hard to say, exactly" is the fairest response. • Moss has averaged 0.36 EPA/P over his career while receiving something around 25% of his team's targets. • Here are the Viking receivers with more than 10% of team targets: V.Shiancoe (0.32 EPA/P, 17.7% of targets), G.Lewis (0.01, 10.4%), P.Harvin (-0.06, 20.8%), and B.Berrian (-0.34, 12.5%). The absolute best thing about contributing to this site -- besides all the women, fame, and money -- is that I get to, via email, ask Brian Burke all manner of childishly simplistic questions and that, owing to the fact that we're, at some level, "colleagues," he feels compelled to answer them. One topic about which I asked him recently concerns team rushing, and the sometimes stark differences between a team's Run SR and their Run EPA/P. As you probably know, Brian has recently found a pretty high correlation between a team's Run SR and both (a) their pass efficiency and (b) overall performance in terms of scoring points. With that in mind, I found myself looking through the new Advanced Team Stats here, to get a sense of which teams have and have not performed well by Run SR. In so doing, I found what I considered to be an odd thing -- namely, that teams with high Run SRs didn't necessarily perform well in Run EPA/P, and vice versa. Like, last season, San Diego finished 29th overall in terms of Run EPA/P, but fourth overall in Run SR. Similarly, Houston finished 31st overall by Run EPA/P, but fifth in Run SR. I asked Brian what those splits could signify. He replied, very patiently, as follows: "It would mean that they didn't hit a lot of home runs. They were successful grinders, and probably fumbled too much, or at least were unlucky with fumble recoveries." That makes sense. And not only that, but it also means that we might, at some level, be able to separate a team's offensive line from its running backs. Why? Well, because, generally, an offensive line has a great deal of influence over the running yardage gained (or not gained) close to the line of scrimmage -- which, when it comes to judging "success" (i.e. creating a postive EPA), that's all we really care about, usually. EPA, on the other hand, is also sensitive both to long runs and fumbles -- i.e. things that SR doesn't specifically measure and which are generally the province of the running back himself. By way of example, imagine a simple off-tacke run to the right. If the running back is hit in the backfield or at the line, it's probably not his fault. Rather, it's probably the case that one of the offensive lineman either missed his assignment or was just generally overmatched by his defensive counterpart. If the running back is able to gain four yards, surely some of the credit should go to the back -- he did, after all, execute the play correctly and find the right hole -- but mostly we can probably say that the offensive line is responsible for those yards. Finally, if the back is able to rush for a much longer gain than would render the play merely "successful" -- well, we can probably say the credit for that belongs mostly with the back himself. 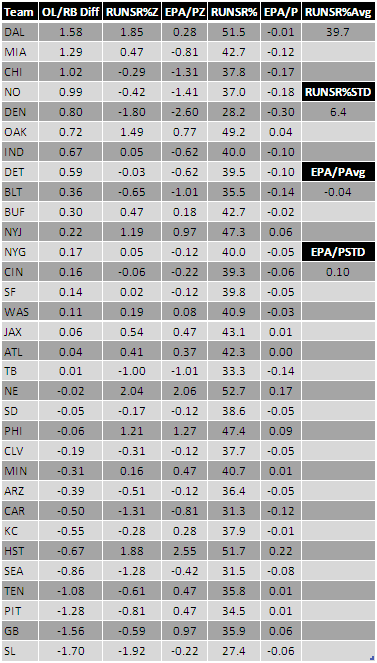 With that in mind, I decided to find the Run SR-EPA/P splits for each team. For each team, I found the z-score (i.e. 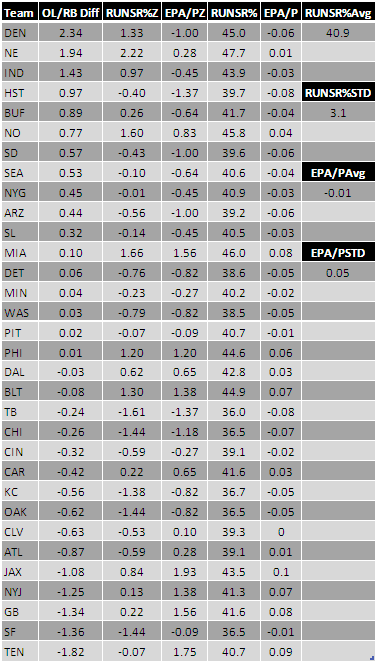 standard deviations from the mean) both for the team's Run SR and also Run EPA/P. I then found the difference between the two z-scores (RunSR%z - EPA/Pz). The teams with the highest positive scores likely have better offensive lines than running backs; teams with higher negative values likely have better running backs than linemen. Again, to reiterate: there are a number of generalizations being made here, so this isn't intended to be a definitive measure either of running back or O-line talent. • It's not shocking to see Tennessee at the very bottom of the list, as Chris Johnson was incredible last season. Seriously, consider: only six backs had at least 300 rushing attempts. Five of them -- Cedric Benson, Steven Jackson, Thomas Jones, Maurice Jones-Drew, and Adrian Peterson -- averaged between 4.2 and 4.5 YPC. Johnson, who actually had the most carries in the NFL last season, averaged 5.6 YPC. Crazy. • It's also probably not shoocking to see a number of excellent passing teams -- New England, Indianapolis, Houston -- towards the top of the list. Defenses are unable to stack the line against an efficient pass attack the way they could against, you know, Cleveland. Also, it's possible that those teams have good passing games in part because they have better-than-average offensive lines. • One surprise is Green Bay all the way down towards the bottom there, a suggestion that they're getting better performances from their rushers than linemen. What could explain that? Well, for one thing, Ryan Grant only fumbled once all season. A fumble usually creates about a four-point shift in EPA. For another thing, there's Aaron Rodgers, one of the better rushing QBs in the league. • Green Bay is once again towards the bottom of the list, and Ryan Grant has all of eight carries. • Denver, who finished with the largest positive split last year, seems to be in roughly the same place this year. Except, in 2009, they at least sported an above-average RUN SR. In any case, it's possible that Knowshon Moreno isn't an NFL feature back. • With as high as their team Run SR is (51.7%), it's amazing that Houston's Run EPA/P is even higher. Arian Foster is undoubtedlty responsible for that. I'm really not thrilled with the SR stat. I went into a bit of detail on this on the comments page for the original subject. I just feel like it sets the bar way too low for "success". It bugs me that a 3 and out with three straight runs can have 2 successes and only 1 failure while 3 straight incompletes results in 0 successes. For that matter, a first down on third results in one success and 2 failures. I think that with more runs coming on third and short and more passes coming on third and long, it will confuse people by leading them to think running is more successful. I see what you are trying to do with it, but I like EPA and WPA much better. Not all successes are created equal, and I just see teams routinely earning 0.1 expected points 9 times before losing 3 expected points saying hey we were 90% successful on that drive. Regression toward the mean by itself was likely to make the Vikings much better with or without Moss. They are almost certainly going to get better. He'll likely get all of the credit whether he deserves it or not. I think the main problem with this kind of analysis, is that the distribution between the line and the Back is mostly wrong. Stuffs: Probably go mostly on the line, as I have seldom seen a RB make someone miss behind the LOS. These would be mostly (70-30) on the RB, as he needs to get cleanly through traffic or carrying the pile a few extra yds. Of course this never would occur without solid blocking by the line, and it might also just be a king sized hole he fell through, but I think that is where good and bad Backs separate. I would definitely agree Run SR is predominantly a function of the o-line, and EPA/P becomes a function of that, plus RB open field ability, plus fumbles, (plus sample error, i.e. luck). One of the things I do like from Football Outsiders is their "Adjusted Line Yards" metric. I wouldn't do it the way they do, but I like the concept a lot. I agree with Kulka's premise that the line still needs a lot of credit on most plays including long runs. A runningback can't break a long play unless the line did it's job to get the first hole open. The fun part would be taking this to the next level and sorting out different situations (3rd and short on the goalline vs 3rd and 15 at midfield), separating types of plays (dives, sweeps, off tackle, draws), and the runningback themselves (Bradshaw vs Jacobs comes to mind). If we had the data determining the linemen and tight ends on the field at the time would be awesome too. That's exactly the point though. On a long run, the line gets credit (in the form of a successful run) and the back gets credit for making the successful run into a long run. If you had an o-line that constantly opened up huge lanes, but a poor back who can't take full advantage then you would see a large success rate (even I could make a few yards behind a great o-line) but poor EPA (I would almost certainly be tackled the moment I moved beyond my blocking). Being from Atlanta, I have to say that it's not all O-Line in running. The Falcons' wideouts usually do a stellar job of blocking on running plays, too. Which is why Brian (I can't get open) Finnerhan and Michael (I can't catch the easy ones) Jenkins still get lots of plays - because they run-block better than a lot of tight-ends in the league. The point being that while teams don't sub-out the O-Line that much, they do make substitutions in receiver sets frequently, which is something that may need to be tracked in any analysis of blocking efficiency. Heck, it's probably easier to find the receivers who are "good in the running game" than it is to find the O-Linemen. I understand your problem with success rate--but look at the underside of the coin. Anybody who measures stats knows that passing generates more yardage than rushing--that's why rushing EPA/WPA are much lower. However, (iirc) both Brian & Football Outsiders have shown that RUSHING is much more successful on 3rd/4th & 2 yds or less to go. However, since most defenses will tend to defend against the run (ESPECIALLY at the goal line) on these plays (obviously depending on the offensive formation--you don't expect an off-tackle handoff is there are 5 wideouts and the QB is in the shotgun), they tend to be short gains. I would expect that on a 3rd/4th and 1, the median or mode gain of rushing is 1 yd. In other words, the offense tries to execute a play that will pick up the first down/touchdown. They are not looking for a 20-yd gain--just that yard(s) that will keep the chains moving--this is what SUCCESS RATE tries to measure. I will also mention that I have read more criticism recently of coaches who made bad strategy decisions toward the end of the game by passing on 3rd down, trying to pick all the yardage up, all the while KNOWING they would HAVE TO go for it on 4th down. So, on 3rd and 10 from midfield with a minute left, they throw an imcomplete pass 12 yds downfield--and then leave themselves a difficult 4th down. Sure, a 3rd down draw that picks up 5 yds is not "successful"--nor does it have much of a chance of picking up that conversion, AND probably will burn more clock. But 4th & 5 is easier than 4th and 10. And probably a better play would be a ~5 yd crossing route where the receiver can get some YAC, MAYBE pick up the 1st down, or at least get out of bounds. In this scenario, it makes sense to look at these plays by some measure of success rate--did the play SUCCEED in doing what it was designed to do??? Another common scenario--the team with the ball is ahead, trying to bleed the clock--the most SUCCESSFUL play is a run for 3-4 yds while staying in bounds. WPA/EPA is not going to value this play much--partly because there is not much to gain (they may already have a 80+% WPA). However, it 3 of those will probably pick up the first down, and probably put the game on ice. Contrast that with 3 passes, the first 2 incomplete, but the third picking up the first down. Not nearly as much help toward winning the game. "Anybody who measures stats knows that passing generates more yardage than rushing--that's why rushing EPA/WPA are much lower." Thats why I'm not using pure yards. I am very cognizant of the fact that on a 22 yard gain on 3rd and 2, the extra 20 yards isn't as valuable as the first 2. But that is already accounted for in EPA. Its based on the expected points from that down and distance at that place in the field. As for running being better on 3rd and 2, I don't really dispute that. I guess my main point is that the most manageable 3rd down situation is to get a first down on 1st or 2nd. In normal football situations, (ie its not the fourth quarter with a lead), throwing two incompletions and a 24 yard pass is just as good as running the ball 6 times in a row for 4 yards a piece. I think EPA acknowledges this basic fact. SR does not. "Another common scenario--the team with the ball is ahead, trying to bleed the clock--the most SUCCESSFUL play is a run for 3-4 yds while staying in bounds. WPA/EPA is not going to value this play much--partly because there is not much to gain (they may already have a 80+% WPA). " I don't disagree at all that this is a key situation. I do disagree that SR measures it and WPA doesn't. WPA actually does a far better job. SR would say that a 5 yard run in the first quarter is the same as an effective 3rd down run to ice the game in the fourth. They are both a "success". But they are nowhere near equal. In truth, WPA would indicate that the gain in win percentage was far greater for the second one. When you say WPA doesn't value the last 20% going from 80% WP to 100%, I strongly disagree. It might not seem like much because people have a tendency to round up from 80 to 100 but going from 80 to 100 is the same thing as going from 50 to 70. I don't think that a team that goes from a 50/50 to a more than 2 to 1 favorite to win the game is an insignificant move. If you score a touchdown early in the game, your WP will be about 70% after the kickoff to the other teams 30 yl. So in essence WPA is saying that those late fourth quarter 4 yard runs when you are already winning are worth as much as that 80 yard pass play for a highlight reel touchdown in a tie game. That isn't undervaluing them at all. In fact, nearly every casual fan would tell you the touchdown in a tie game is far more valuable. If anything, WPA puts an even greater emphasis on successful fourth quarter timebleeding than conventional wisdom does and certainly far more than SR does. One of the reasons SR is important is because of its minimax relationship with passing success. For example, consider two ways to get +2 EP by running: The first is 1 big run for say 2.5 EP, and 2 other runs for -.5 EP and 0 EP (in any order). EPA=2.0, SR=0.33. The second is 3 runs for +0.6, +0.8 and +0.6 EP. EPA=2.0, SR=1.00. The second string of runs is going to have a bigger effect on the defense and help open up the passing game. Not that it should. It just does. Another advantage of SR is that it is more consistent from wk to wk. It filters out a lot of the randomness of big plays or fumbles lost. SR is a relatively noise-less stat. I'll have a lot more on this in a later article. But don't get wrapped around the axle on which stat is better. I think of these as tools, and each has its intended purpose. There is no answer for whether a hammer is better than a screwdriver. Team running SR is a good tool but success rate is a little more problematic when applied to individual RB's where situational and or play calling biases can come into play. The "OL/RB diff" stat could also be an indicator of whether a team is using the pass to set up the run or vice versa. When using the pass to set up the run, teams can expect a higher SR:EPA ratio because there are fewer defenders close to the line of scrimmage and more defenders in the secondary to prevent a high-EPA run. Every team at the top of the list fits this profile except maybe Buffalo. On the other hand, when the offense is running to set up the pass (or in this case, running to set up the long run), defenders will cheat closer and closer to the line of scrimmage to limit SR, but the lack of players in the secondary means that if the RB makes it through the first level, no one is there to stop him from scoring a TD (see: 2009 Chris Johnson highlight reel). All teams at the bottom of the list fit into this profile except Green Bay. One of the advantages to running is that it keeps the ball away from the opponent. Thus, the ability to eat up time better than the passing game ever can. The only way a passing game can do as well to eat up time is if they complete every pass. Also, three incompletions gives the opponent the ball back with as little as 18 seconds expired. One refinement in the success of the run I'd like to see added is the advantage at the end of a game to eat time and control the clock. Have you done any work on the time of possessions, number of possessions, running, passing, and winning? Sports writers don't know enough about football to understand what they mean when they say "return to their roots", but let me speak for them. 1) Everyone, even the dumb coaches and sports writers, know this is a "passing league" now. 2) As such they have all rushed to switch to 3-4 defenses and gone crazy for edge rushers. Pass rushing and pass coverage assets are being bid up by the marketplace. 3) So the best thing to do is find a way to beat those kind of defenses. How? Here's a hint: 2TE, 2WR, 1HB, and a lot of play action and quick releases. Look at what he's been drafting and moving towards, this is his plan. I see a decent run game and lots of mismatches between TE and the people covering them in the future. 4) Also, this will work good for Brady because it comes naturally to him, and problems with his ability to bomb it deep as he ages won't be as big a deal. 5) Also, Bill hates depreciating assets. Moss is 33. God forbid there is a lockout he will be 35 when he next plays. And he wants a ton of money. He doesn't fit the system they are building, why bother with an aging diva. 6) Bill knows his young defense might not be ready for a SB run. He drafted a lot of people last year, and has a ton of picks in next years draft. The time to make a run is next year. Although run SR and run EPA have a surprisingly low correlation in 2009 (.57), it was quite a bit higher in both 2008 (.75) and 2007 (.84). So looking at divergence between the two may not always tell you a lot. It seems more significant to me that run SR actually correlates better with offensive WPA over these seasons than does run EPA. Does that suggest that coaches may actually be correct to focus on run SR, as opposed to run EPA? Moreover, the correlation between run SR and pass SR is consistently higher than between run EPA and pas EPA. Indeed, run SR actually correlates better with pass EPA than does run EPA. All of this seems to suggest that run EPA may not be measuring what you want it to. Or is this somehow a byproduct of winning teams using the run to run out the clock? Run EPA is very sensitive to fumbles and more importantly fumbles lost, which can be pretty random. I think long runs, that add lots of EPA, are usually a function of defensive breakdowns more than any offensive attribute. I think SR correlates with WPA (and by extension winning) for a few reasons. Even if it's not truly optimum, it's the game all coaches play. There aren't any coaches out there who are willing to deviate from convention to expose the strategic flaw (if it really exists). It also sets up passing success, which is very determinative. Lastly, it's valuable for preserving leads late. The randomness of run EPA might explain why it failed to predict future success, but these metrics are all measuring current performance, so randomness seems neither here nor there. I don't see how coaches' strategy can explain this: even if they are all using non-optimal strategy, those who end up with higher run EPA should still win more. And to the extent run SR actually improves passing (more than run EPA), then isn't that a way in which run SR is measuring run effectiveness better than run EPA? Preserving late leads does seem like a relevant factor, though it seems unlikely it can explain this large disparity. It does seem to me that this may be revealing a problem with run EPA. Not sure what you mean by that. Run EPA does not "have a problem." It is exactly what is is: expected points gained on run plays. It's not designed to be predictive. It's designed to measure what it measures. Teams with higher run EPA do win more. The relationship just isn't as strong as with SR. I think SR is measuring perceived effectiveness of the run, which is what counts when it comes to how coaches strategize. It makes sense that run SR correlates stronger with WPA than does run EPA because WPA is a time-sensitive stat while EPA is not, and running is generally used more for burning clock than it is for scoring points. I wonder if this correlation holds up if you only look at runs in the 1st quarter. Brian: Right, run EPA measures what it is supposed to: the immediate contribution of each run. Let me try to make my point more clearly. Run SR is capturing another value of running well -- not captured by either run EPA or run WPA -- which is that it improves passing performance. That is why run SR is a much stronger predictor of total offensive WPA: it captures much of the information in run EPA, PLUS some of the information in pass EPA. But run EPA doesn't do that. In fact, if you run a regression to predict offensive WPA and use both run WPA and run SR as predictor variables, run SR is very significant. That would be impossible if you were correct that run SR is only measuring a perception, rather than reality. Run SR has a payoff beyond what is captured in the running stats, which must be improved pass performance. What this means is that the passing metrics (EPA, WPA) are in part reflecting the quality of a team's running game, which takes the form of better pass success. Which then calls into question all the analyses that seem to show teams run too little. That could be true, but we can't answer that until we account for this interaction effect, in which running success enhances passing success. A question: Is it DEFINITELY that a greater Run SR has the payoff of improved pass efficiency -- or could it also be that, as mentioned above, a better-passing team might have more opportunities to run successfully (as defenses are forced to respect the pass)? Sorry if you've somehow addressed this point and I simply missed it (or didn't understand). Carson: That's a great question. I'm sure the causal relationship runs in both directions, but it seems possible to me that a good running game does much more to improve passing than the reverse, or vice versa. Brian will be way smarter than me at thinking through how we might try to separate the two. One observation: the correlation between run SR and pass WPA (.43) is higher than the correlation between pass SR and run WPA (.32). That might indicate that the good-running-improves-passing factor is stronger than the good-passing-improves-running factor. Certainly it seems like the Success Rate metric measures something very important in the running game, while pass SR doesn't seem to tell us much more than EPA/WPA (pass SR and pass WPA have .90 correlation). Doesn't the NFL track yards after contact nowadays? I could swear I've seen that graphic during a game. Yards before contact seem to reflect blocking (line or otherwise) as well as the RB, while yards after contact are mostly the RB. This probably doesn't account for shiftier RBs who don't get hit as much even behind subpar blocking, but I think it has some value.